* Internet Explorer 5.0 or greater. * GEIP software or hardware license. a) Change the Primary and Backup card numbers to a different card number. which displays the desired IP address. 3) Save the configuration file. * MBE validated runing under Windows 10. Create and manipulate objects exposed in the I/O Server from another application. Create tools that access and manipulate driver objects. These tools can include embedded macro languages or external programming tools. The I/O Server – The core executable program. The I/O Server maintains the driver's channel, device, and datablock objects, performs all required functions for communicating with the process hardware, and exposes the methods and properties to other applications. The I/O Driver Power Tool – A client application to the I/O Server with a graphical user interface. 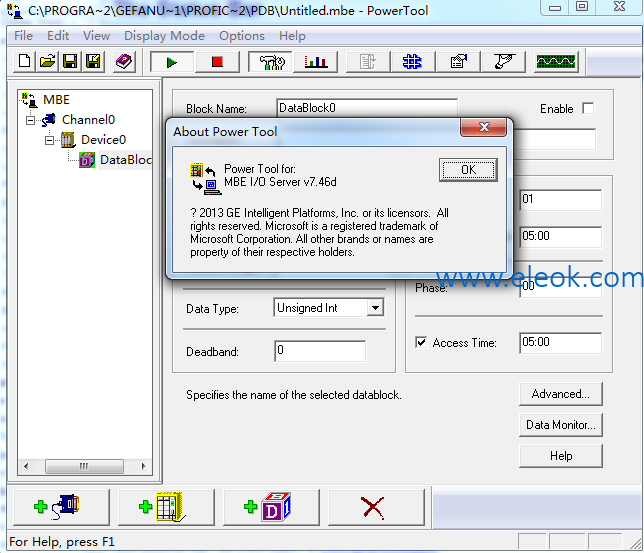 The Power Tool accesses the I/O Server and lets you view and modify channel, device, and datablock properties. You can also view and modify driver properties with a custom client application developed specifically for your system. Refer to Creating Custom Client Applications to learn more about creating your own client application. Version 7.x drivers let you automatically add addresses to the driver configuration while you are configuring your iFIX Database. When you add a block to the database that accesses a point in the hardware that you have not configured, the point is automatically added to the I/O Server and polled for data. Refer to Feature: Creating Datablocks Automatically in iFIX Database Manager to learn more about this feature. Version 7.x drivers are event-based rather than time-based, reducing CPU time and increasing performance. Version 7.x drivers also comply with the OLE for Process Control (OPC) v1.0a standard. Any 1.0a OPC client application can access process hardware data through the I/O Server. Refer to Feature: Using the OLE for Process Control (OPC) Functionality to learn more about the advantages of OPC.